From our gravel pit, we can provide aggregates for commercial, industrial and communal projects in the Collingwood area. At Flesherton Concrete Products, we know you value having high-quality materials for any number of construction, paving, or landscaping projects. That’s why we are your first resource when you require aggregates and concrete products that will ensure the success of your project in Collingwood, Ontario. At our gravel pit, we source materials that are ideal for a variety of applications, and it is easy for us to provide the delivery services you require. From our gravel pit, we can provide aggregates for commercial, industrial and communal projects, and we can deliver the right amount of gravel, sand and stone for your needs. Our services make it easy to have your preferred aggregates delivered straight to your construction site. In addition to our gravel pit products, we also offer crushing & screening for high-volume requirements, and we can provide limestone, sand, and concrete mixing materials to meet your needs. 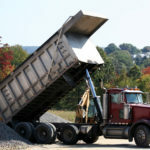 Our aggregate delivery options include dump trucks, stone slingers, dump trailers, live bottoms and hoppers – simply let us know your intended usage and preferred delivery method. If you have questions about our gravel pit or any of the products and materials we can supply, contact us at Flesherton Concrete Products today. We have been a trusted name in the concrete, gravel and stone business for more than three decades, and you can rely on us to provide the solutions you need for any number of projects in the Collingwood area. Contact us today to order your products from our gravel pit and to schedule delivery. At Flesherton Concrete Products, our gravel pit serves customers in Collingwood, Wasaga Beach, Flesherton, Orangeville, Owen Sound, Barrie, Stayner, Mulmur, Shelburne, and Mount Forest, Ontario.